I am sure that majority of you reading this post have watched at least one full face highlighter challenge, they are everywhere on YouTube and Instagram. This post isn't a full face highlighter challenge more of a summer glow makeup look. As the summer season is slowly creeping in, so is the amount of highlighters being sold in the makeup market. Here is my minimal summer look. Before applying makeup, I like to use a lightweight moisturizer like the Caudalie Vinosource Moisturising Sorbet* which keeps my face hydrated and fresh. For my dry skin, I like to use a facial mist either the Caudalie Vinosource Grape Water* or Vitamin E Facial Mist to ensure my face is completely nourished. As I have combination to dry skin, I don't apply primer just because I feel like it makes my face look incredibly dry so skipping to foundation, I use the smallest amount of the Clinique Beyond Perfecting Foundation and Concealer with a foundation brush. To blend that in, I use a damp beauty blender. For under my eyes, I like to use the LA Girl Concealer mixed with the NARS Creamy Concealer, as my base is quite minimal I like a bit more concealer around my face. 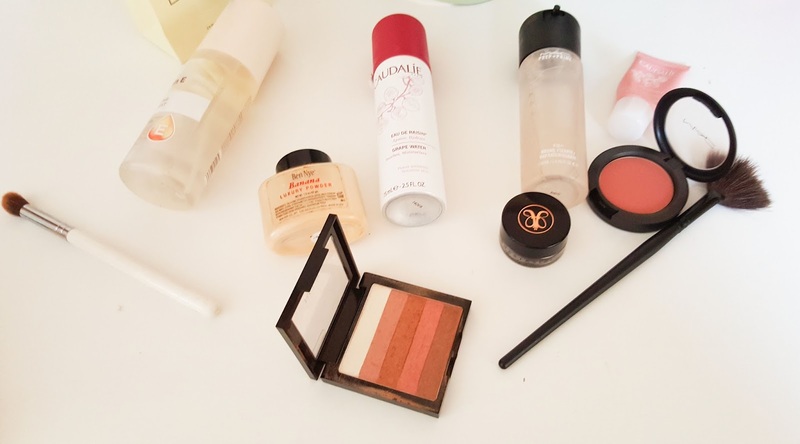 To set my under eyes, I use the Ben Nye Luxury Powder with my damp beauty blender, I don't apply powder as I want my face to look fresh and glowy. For my eyebrows, I opt for the Anatasia Beverly Hills Dipbrow Promade in Ebony and set around my eyebrows with a bit of the loose powder just because I feel like it reduces any unnecessary oils around my T-Zone. For the eyes, I like to use brown, gold shadows all over my lid with a bright white inner corner colour. To coat my lashes, I like to use the Clinique High Impact Mascara for long lengthening eyelashes. Now, for the fun part....For highlighter, I use the Real Techniques Contour Brush to apply highlight on the tops of my cheekbones. Then using a fan brush, I apply a bit more as well as on the tip on my nose and cupid's bow. If I feel like I want to blind people with my highlight, I spray my brush with MAC Studio Fix Plus and add more highlighter. To finish off the whole look, I add a little gloss to my lips. What's your go-to summer look?